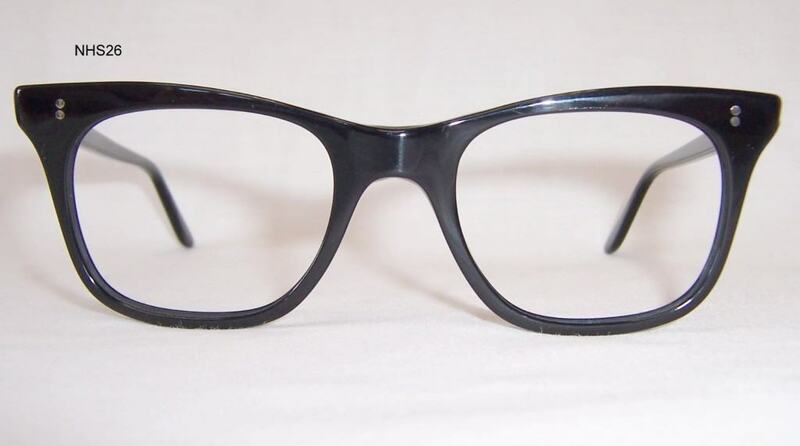 Back in the day the National Health Service glasses were all the rage – colourful acetates adorned millions of people’s peepers in post-war Blighty. For the best part of four decades until 1985, the NHS provided a range of glasses for the masses, known for not being so easy on the eye, they definitely still had plenty of admirers. Most notably, these came from abroad, as paid-for state medical appliances grew in their appeal across the continent. Consumer choice during the mid 20th Century period was very much price-led and the aftermath of World War II saw the Brits embrace eye health with gusto -eye care was on the up! This was largely in part thanks to the overwhelming government drive at the time. Health assessments were as de rigour as pencil skirts, whilst opticians were enjoying a golden age between 1948 and 1951. It might not be time to dig out the gramophone just yet, but it just goes to show what an impact glasses had on society. Many new patients were queuing up in order to grab themselves a pair of glasses. 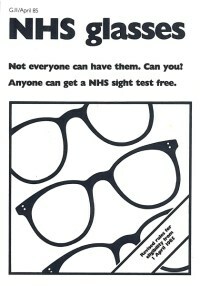 After a few crosses and forms, many enjoyed a spanking new pair of NHS specs. On top of this, optometrists had the chance to perform a range of eye examinations on those emerging patients. Some, so it is claimed, demanded their eyewear even though eye tests declared there was no requirement! Free frame propaganda was plastered everywhere. This was not only to create awareness but to encourage people to take up free subsidised frames. So what exactly was on offer to people? You had the opportunity to benefit from up to ten different complimentary frame styles, with seven extra for a nominal fee. Unlike current product lines as well as materials, the choice was certainly not plastic fantastic as it is today. With only two colours available, either black or brown, many were stuck between a rock or a hard place. At its peak, the NHS glasses scheme cost a whopping £15 million, somewhere in the region of £40 million by today’s standards. In 1950, the initiative was costing in excess of £20 million on an annual basis. North of the border, the Scots were extremely keen to take up free glasses as numbers from the time revealed that four times as much uptake came from our Scottish neighbours. Other number crunching highlights that took place around the period demonstrated the surge of interest. Approximately 5 million eye tests and nearly 8 million specs were distributed. Demand was without doubt outstripping supply and by 1950 there was a myriad of requests. With waiting lists hotter than access to the Groucho Club, many consumers had to wait 18 months to land a finished pair. But cuts were around the corner as metal specs were the first to get the chop. This was put down to cost in 1951 by the Labour government who then decided to make patients pay a round pound. A quid is not that much to cough up, but to many hardy patients this was more a case of we’ve been framed. As far as selection was concerned, NHS specs were usually assigned by numbered systems, incorporating three and sometimes four figures. The 524 was considered to be the bog standard pair at the time. More often than not, these specific glasses often started with the iconic NHS stamp. This was usually located on the inside of the frame or close to the nose pad. Official stamping only came into action in July 1951, which was deemed to be compulsory. Like Dallas, the NHS range attempted to make a comeback at the beginning of the 1980’s with the 924 ladies glasses. For the first time in more than three decades, it was an attempt to make the NHS collection more chic for female wearers. Specifically tailored for women, it was available in pink, brown and lilac but were a spectacular failure. Nevertheless, NHS specs did manage to have a good innings. They were eventually discontinued in 1985 having been replaced by vouchers. 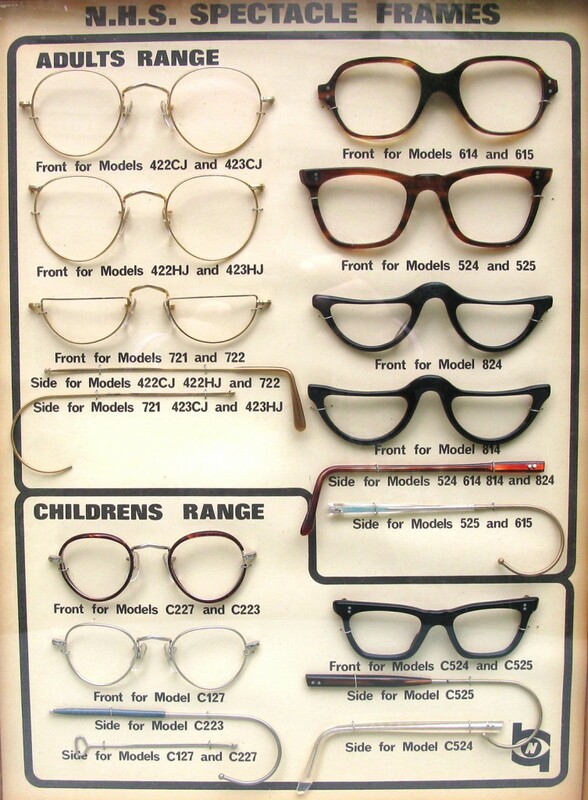 Even now, this particular range of eyewear has many reaching for the nostalgia klaxon. Their premium quality and retro-chic influence can still be seen in many desirable glasses today. The classic plastic styles are making more of a comeback than Bucks Fizz. Even celebrities have even drawn inspiration from the NHS such as Billie Jean King most recently at Wimbledon. But the fun doesn’t stop there. 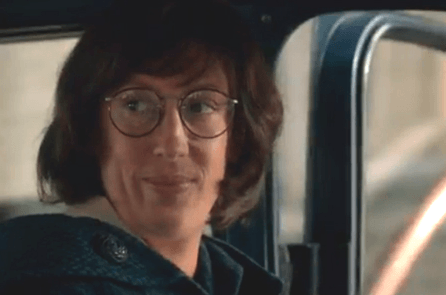 Last year’s Call The Midwife saw Miranda Hart strut in a pair of NHS inspired panto specs. These oversized lenses caused a real fuss among telly addicts. They may not be pants just yet but panto glasses are not a firm fixture of Widow Twankey’s wardrobe. Au contraire mon ami, panto were a favourite of many NHS wearers back in the 1950’s and 1960’s. The actual term derives from pantoscopic, often described as seeing everything clearly. These specific frames encompassed a melange of round and oval, which included a highly positioned hinge. This would complete the overall look and would result in the best lenses. From the pantoscopic to the performers, Gareth Malone tried on a pair of NHS inspired specs on for size whilst doing Children in Need a few years ago. Malone had his eye on coaching celebrities for his all star choir and was spotted in something very close to the signature NHS 524 in one episode. Meanwhile, another BBC show, Gardeners World got in on the NHS act too. One of their experts Alys Fowler is known for more than just her marjorams! She has been seen sporting a wealth of frames including a few influenced by the NHS age. Talk is cheap we know – but perhaps not as cheap as the 1950’s NHS collection. But if you’re still nostalgic over those frames and want some snazzy specs for a fraction of the price, check out our sensational £6 range here. Yes, we must follow the fashion also, but comfort comes first. Eyeglass frames are these days available in endless designes, colors and shapes. We must choose frames according to our fetauresa nd face structure that best suits aour personality and persona. I like the possibility that we can go and buy retro in any fashion and wear it at will, but I am grieving for the old style of spectacle case, which was slim, made of folded metal with a lip to tuck the earpieces behind and had a good spring to hold it closed. When I buy glasses these days the smallest cases available could fit two pairs of my glasses inside them. They are bulky and irritating, and the edges often dont close flush, so they dont keep the glasses protected when knocking around in a bag. I would love to hear of someone, somewhere who is still making the old NHS-style cases.